Anyone who loves alternative clothing will tell you this store rocks! What started in 1988 as a cool music-culture themed store, quickly turned into a hot place to shop. With clothing and accessories featuring Bauhaus, The Cure, TSOL and Depeche Mode, they had a devoted following from almost the start. By 1990, they not only carried 50 different band titles but also had gear for underground cartoons, cult movies, and comics. If you’re a fan of South Park, Care Bears, SpongeBob, or Superman, then you’re sure to love this store! And guess what? When you purchase a discounted Hot Topic gift card you will get more alternative culture wear for less money! Today there are more than 600 stores in the United States, usually conveniently located in malls. 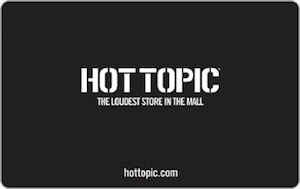 Who wouldn’t love to have a Hot Topic gift card in their wallet for their next trip to the mall? And with departments in girls, guys, plus sizes, tees, band merchandise, funko, pop, seasonal, and more, you can find a unique item for anyone on your list! And yes- you read that right- they have a department in funko. How can you not love that? So now that you know where to go for all your funky alternative merchandise let me mention that when you purchase a Hot Topic gift card you’ll get more cool stuff for less money! Good deal, right? A Hot Topic gift card also makes an excellent present! But don’t stop there, Cards2Cash offers gift cards for many other retailers, from department stores to pet shops! Make sure you check out our listings for Zumiez, PacSun, and Rue 21! At Cards2Cash we understand how expensive life can be and we work to save you money in as many areas as we possibly can! Do you have a Hot Topic gift card you aren’t going to use? Cards2Cash will turn that unwanted card into money! We pay the highest possible price for gift cards. If interested, just stop in one of our retail locations, and we’ll pay you on the spot, OR you may fill out our easy online form, and we’ll get back to you quickly with an offer for your unwanted gift card. Cards2Cash is your one-stop gift card shop!